The Parade of Garage Sales is fast approaching! This year is being sponsored by Jennifer Hooper a realtor with CIR Realty. There will a station at the shed at the Evergreen Community Park where will be handing out maps and bottled water. 1150 Everridge Dr. SW. Station hours 9am-3pm, Saturday and Sunday of the Parade of Garage Sales. 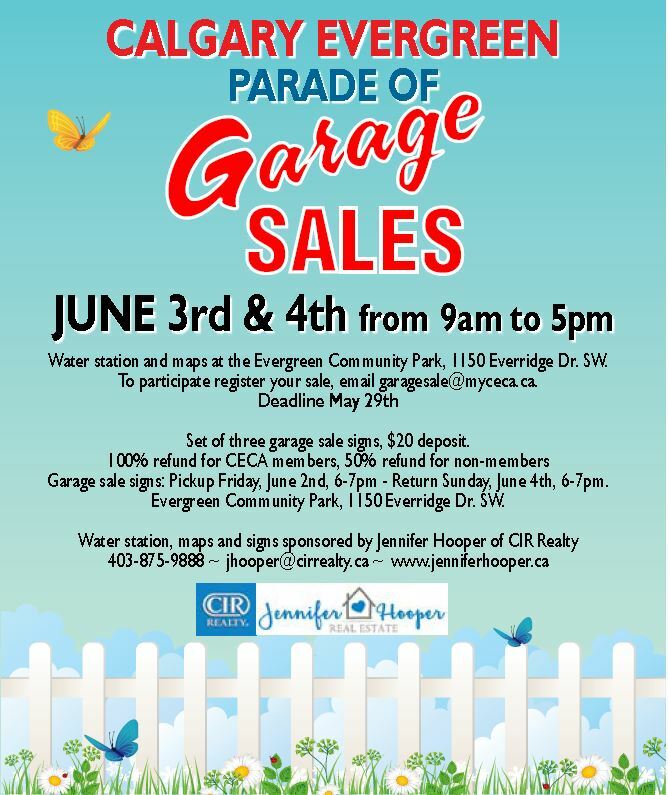 If you are interested in having your garage sale on the list for all to see; please email garagesale@myceca.ca for more information. Register by May 29th, 2017. For a $20 deposit for 3 lawn signs. CECA Members receive a 100% refund when you return the signs; non-members will receive a 50% refund. Online map of garage sales to come. They are not doing maps or signs, just bold signs. Their parade of garage sales is on the same weekend.